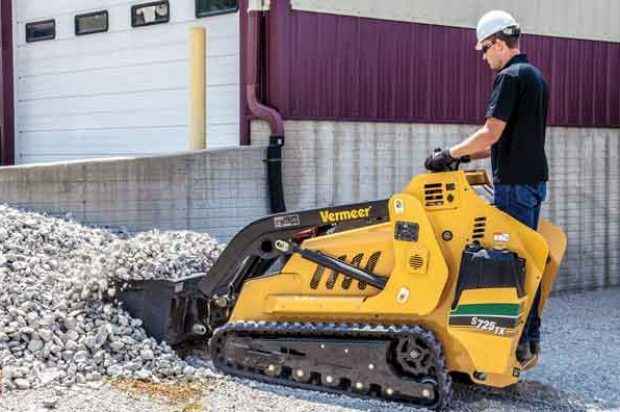 Founded in Pella, Iowa, Vermeer serves customers in more than 60 countries with a full line of tree care, landscaping, rental, underground construction, surface mining, environmental and agricultural equipment. 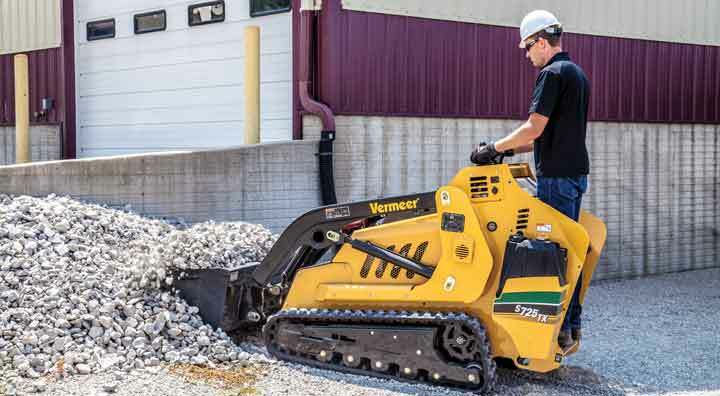 Vermeer introduced its first compact utility loader (compact tool carrier) in 2003 to help contractors in the landscape, rental, tree care and utility markets complete jobs more efficiently. Vermeer currently offers four compact tool carriers ranging from 25 to 40 hp. The newest addition to the Vermeer compact tool carrier portfolio is the CTX50. It features vertical-lift arms that allow it to hoist more weight than a similarly sized machine with a radial-lift path. It has a 600-lb, ISO-rated operating capacity, a tipping capacity of 1,715 lbs and a full lift height of 72 in. The CTX50 has a 25-hp Kohler Command PRO electronic fuel-injected gasoline engine and utilizes a four-pump hydraulic system. A unique stand-on platform design also helps keep the operator out of the mud and debris and provides optimal viewing of attachments during operation. The S450TX offers the customer the ability to customize the machine with the choice of track options. A narrow 7-in. track provides a smaller machine footprint for tight work areas, such as landscaping applications and residential construction. The standard 9-in.-wide track offers reduced ground pressure for increased floatation and stability. The S725TX has a 750-lb SAE-rated operating capacity with a 2,145-lb tipping capacity. A 24.8-hp Kubota Tier 4 Final engine features four cylinders producing more torque than models with three-cylinder engines for improved productivity in tough ground conditions. The largest compact utility loader in the Vermeer lineup, the S800TX, has a 40-hp Kubota EFI gas engine that offers a number of benefits — compared to conventional carbureted engines — such as lower fuel consumption, easier maintenance, improved starting due to the elimination of the choke and cleaner emissions. The high horsepower engine delivers 88.5 ft-lbs of torque, equipping customers with versatility and power to do more with one machine — from landscaping to trenching up to 48 in. deep.